Captain America got famous for being frozen in ice - this guy lives that every day! The Soviets' replica of Captain America, Red Guardian battles for his country and for humanity. There have been at least seven Red Guardians, maybe more, and while their costumes have changed over time, at one point or another almost all of them have dressed something like this. We can be reasonably sure this toy doesn't represent the third Red Guardian, because that one was a woman (though yes, she still dressed like this). So is this Aleksander Lebedev, who fought in World War II but was killed in the purges of the '50s? Alexei Shostakov, who was married to Black Widow? Josef Petkus, who changed the name to Steel Guardian once Communism fell? Krassno Granitsky, who got killed by one of Captain America's villains? "Anton," who claimed to be an ex-Crimson Dynamo pilot, but was actually an LMD? Nicolai Krylenko, who had a toy in the first movie's line? It's up to you! 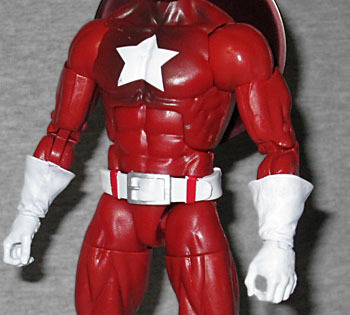 When the back of the packaging called Red Guardian a replica of Captain America, it wasn't kidding! This figure uses all the same bodyparts as Capwolf, other than the head - that means he has the medium body, plus forearms with flared gloves and shins that have folded boots. He's even wearing the same belt as Cap, but it's been flipped over so the buckle points the other direction. Thankfully, he doesn't get the stupid shoulder-straps the previous figure wore, but he also doesn't get any alternate hands. What, Russians don't salute and point? The head is unique to Red Guardian. Like Captain America, he wears a mask that reveals his mouth-al area, as well as his ears. I'm not sure what it is about Cap-masks that makes them look better with exposed ears, but they definitely do. Rather than letting us see human eyes, this head has blank white eyes with dark circles around them. And rather than tiny wings on the sides, the defining feature of a Red Guardian mask is a pointed fin that runs over the head - sort of like a Kree. Considering he wears all red, the figure's paint is surprisingly good. Sure, the boots, belt and gloves are all bright and clean, but there's also a bit of nice shading on his upper torso. The throat, shoulders and chest have an airbushed shadow on them, while the star on his chest is pure and vibrant. 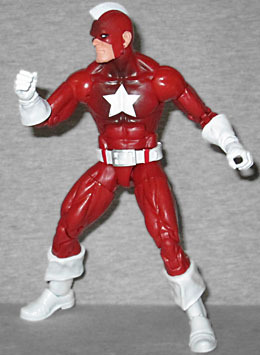 In his first appearance, Red Guardian still wore a red suit with white accessories, but the fin on his head and the stars on his chest and back were red instead of white. The articulation is as you'd expect: swivel/hinge rocker ankles, swivel shins, double-hinged knees, swivel thighs, balljointed hips, swivel waist, hinged torso, swivel/hinge wrists, double-hinged elbows, swivel biceps, swivel/hinge shoulders, hinged neck and balljointed head. All the joints worked fine, straight out of the box. 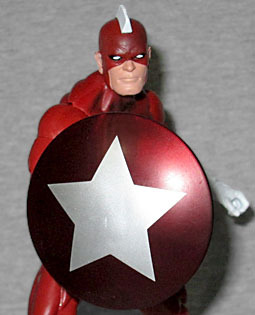 It should come as no surprise that Red Guardian, as a knockoff of Captain America, chooses to fight with a shield. It's been depicted many different ways over the years - sometimes blue or black with a red star on it, sometimes red with a red star in a white circle, and only very rarely solid red with a white star in the center. In fact, the only images we can find of this shield in the comics comes from the '90s, when Petkus would have been carrying it. 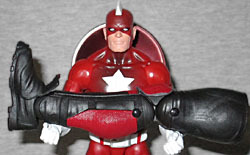 Red Guardian comes with the big right leg of this series' Giant-Man BAF. It has nice texture details, and will probably make for a nice figure once he's assembled. 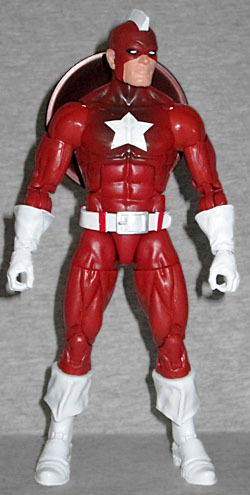 This isn't the most exciting figure in this series, but Red Guardian has only ever had one action figure before, and while it was nice, it wasn't in this scale. Sure, he may be the made-in-Taiwan Moscow version of Captain America, and have a simple repaint to match, but a repaint of a good figure can still be a good figure in its own right.